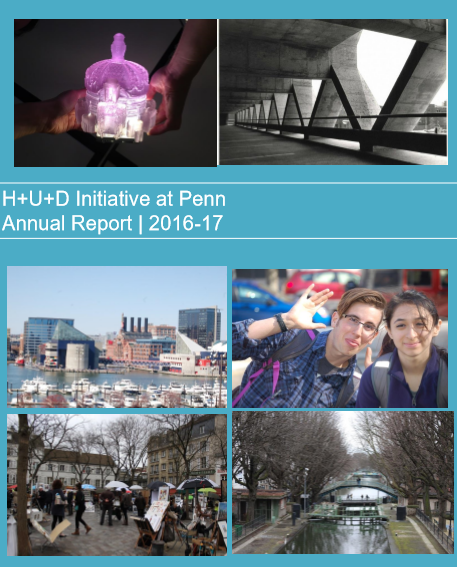 P enn’s Mellon Foundation-sponsored Humanities, Urbanism and Design (H+U+D) initiative has had another productive year in 2016-2017. It has hosted its fourth cohort of faculty into the H+U+D Colloquium, which has met bi-weekly through the academic year and taken three field trips; it has sponsored three courses (two undergraduate City Seminars and a Graduate Problematics Seminar); it has sponsored public lectures, panel discussions and presentations at professional conferences; it has underwritten undergraduate and doctoral research; and it has welcomed two H+U+D Junior Fellows. We want to emphasize that we have sustained the vitality of this project through four year. The various projects established under the wing of the H+U+D initiative have flourished. Most notably, faculty collaborations in research and teaching have emerged that, without H+U+D, would never have existed. And this collaboration has been woven into Penn’s academic culture. To date, the Initiative has sponsored sixteen courses–most of them cross-listed and co-taught, which has begun to imbue Penn’s curriculum with an understanding of the linkages between the humanities and design. Notably, these faculty teaching teams have developed ongoing synergies among themselves and their students, reaching outside the classroom and beyond the end of the semester. Over the past years, H+U+D Initiative has contributed to scholarship. Colloquium members have published monographs, journal articles and created works of art and architecture, all of which has been shaped by and discussed in our bi-weekly meetings. Undergraduates have written remarkable capstone theses, while doctoral students have enriched their dissertation research with H+U+D Initiative awards; and their voices have been heard, too, in the Colloquium. As we contemplate the final year of the H+U+D Initiative, we envision a year of reflection and assessment as we seek to record and institutionalize our work. 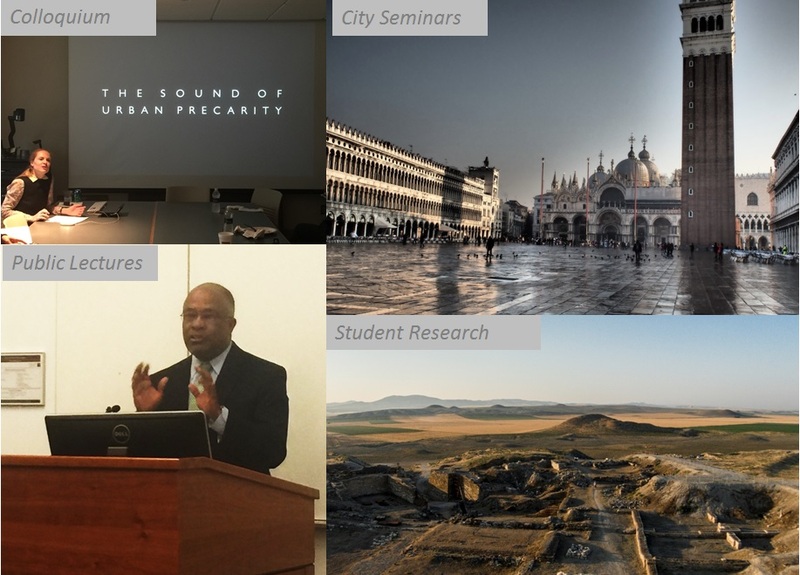 In FY 2015-2016, the Humanities, Urbanism and Design (H+U+D) Initiative continued its five core components: the H+U+D Colloquium, course support, student research awards, public lectures and conference support, and the placement of two Junior Fellows for 2015-2016. Most important, H+U+D initiative, now in its third year, produced many tangible outcomes. The various projects under its wing have flourished. New faculty collaborations have emerged that without H+U+D would never have existed. For example nine H+U+D-sponsored courses in the School of Design and the School of Arts and Sciences at the undergraduate and graduate levels are co-taught by faculty from each school. These faculty teams have developed ongoing synergies among themselves and their students that go well beyond the actual classes. In addition to H+U+D’s substantial contributions to both schools’ curricula, it has also supported public lectures, exhibitions, conferences, and course development that have greatly enriched the university community’s discourse on urbanism. Student and faculty research is breaking new ground thanks to the H+U+D support. Two H+U+D Junior Fellows have joined the ongoing H+U+D Faculty Colloquium that meets bi-weekly. Faculty in the Colloquium are sharing and publishing H+U+D-sponsored research. This report outlines the content of the H+U+D Initiative’s programs and identifies its growing number of participants. convened, under the leadership of the co-directors, a bi-school faculty committee to develop an undergraduate general education course that introduces the interdisciplinary study of cities. inaugurated a program of research fund awards for undergraduate and graduate students who are working across disciplinary boundaries. The Colloquium has successfully inaugurated the planned mixture of discussion-provoking activities: presentations by Colloquium members of their work, discussion of texts that we read together, discussions with scholars from elsewhere, and excursions to exhibitions and urban sites. In the fall, we visited and met with curators at the Museum of Modern Art in New York and the Philadelphia Museum of Art. 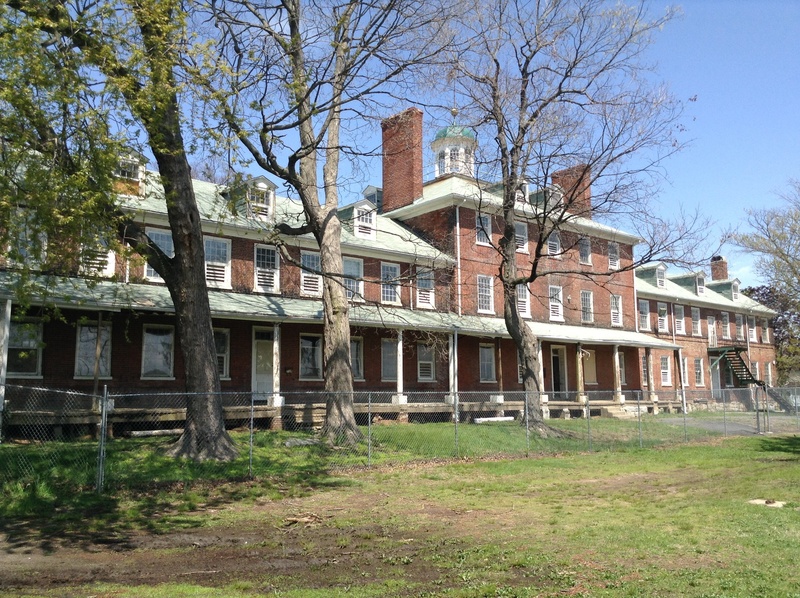 The spring schedule includes a site visit and meeting with the designers and sponsors of the reconstruction of Dilworth Plaza and a visit (by boat) to Philadelphia’s historic quarantine station, the Lazaretto. (See Attachment 2 for Colloquium membership and attachments 3 and 4 for the 2013-14 schedule).